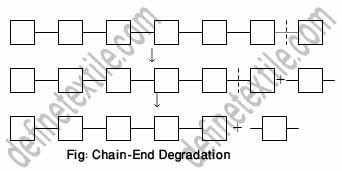 Firstly the degradation start from chain end and resulting successive release of monomer unit. This phenomenon is actually reverse of propagation steps. So this type of degradation called de-polymerization. The molecular weight of the polymer decrease slowly.